“A new paper published in Nature suggests that feeding electronic health record data to a deep learning model could substantially improve the accuracy of projected outcomes. In trials using data from two U.S. hospitals, researchers were able to show that these algorithms could predict a patient’s length of stay and time of discharge, but also the time of death. What if we could use this technology to help drive patient identification (a key goal across GSK respiratory)? By syncing with EHR’s, HCPs would be able to identify the frequent exacerbators, pinpoint when their next exerbation may be and take preventative steps to avoid potentially deadly COPD or Severe Asthma exacerbations. This is hot for 2 key reasons: data and customer engagement. As VRT devices like Alexa and Google home start to infiltrate the home and the office, it will be increasingly important to understand what information users are asking these devices for, and what content people are consumers – making it a perfect addition to our SENSE offering. Podcasts are far from new. However, they provide opportunities to reach and engage a very active group of consumers in an environment that they trust, for long periods of time during moments that are convenient for them. Trust content is hard to come by these days. Additionally, consumers increasingly expect information that’s tailored to their needs and interests. Podcasts provide opportunities to engage these consumers around complicated topics for long periods of time when it’s convenient for them. For pharma companies looking to engage and educate HCPs around new treatment options or opportunities in digital health, this could provide opportunities for content creation and/or partnership. The same can be said for B2B and technology. We’ve all been on those client calls… Aardman spoofs them in the below video. Full article here. Day 3 of Social Media Week NYC brought some great thinkers and doers together to discuss the impact of social listening and intelligence, as well as the broader idea of quantifying and contextualizing human emotion that’s expressed in text, pictures and emoji’s (to name a few) on the internet. In our continuously evolving digital world, I think there are two assumptions we can make about the future: technology will continue to get better and people will continue to use and shape it. As digital marketers, the more tools and approaches we have towards understanding human behaviors in using this technology – and more importantly the emotions or motivations behind those behaviors – the better suited we will be in creating experiences that add value to both their lives and our brand’s bottom line. These new resources (while still new and working out the kinks) are a great indication of what’s to come to help us do so. In the U.S., you may pay for your coffee from the Starbucks app, book a car on Uber and place orders with the Amazon shopping app. But in China, you can do all of these through WeChat Wallet alone. WeChat Wallet functions like Apple Pay, which allows users to purchase products and services with select credit or debit cards (mostly from Asian banks; Chase and Bank of America are not available, for instance.) Unlike Apple Pay, WeChat Wallet has integrated its parent company Tencent-owned services to let its 800 million-plus monthly users do things like pay for utilities and manage personal finance, within WeChat. It has also partnered with a limited number of third-party companies to make them more discoverable on the platform. WeChat is an incredibly popular 1:1 networking platform that successful global brands have recognized as a key platform for reaching the Chinese market. This, coupled with tech like WeChat Wallet and the growing functionalities of ChatBots thanks to sophisticated AI, lays the ground work for countless opportunities for brands to monetize their 1:1 efforts in key markets. Starbucks – a long time early tech adopting brand – is already getting in on the opportunity for WeChat Wallet in this market. For some of our global brands where China is a key market, like ETS, this is definitely a trend to watch. 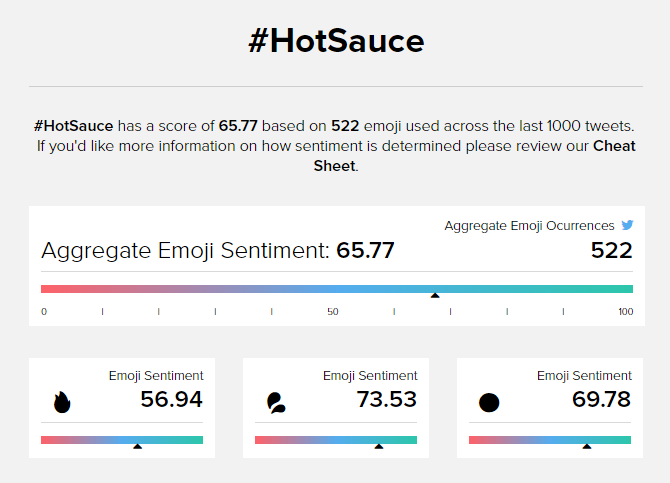 This has direct implications for how we (MRM//McCann) gather and analyze conversational and linguistic data as part of our SENSE offering, as well as how we create and distribute content/experience for our clients. Content & Experiences: Right now, the data is limited to brands and agencies that produce content through Alexa, with the goal of driving more of them to do so. 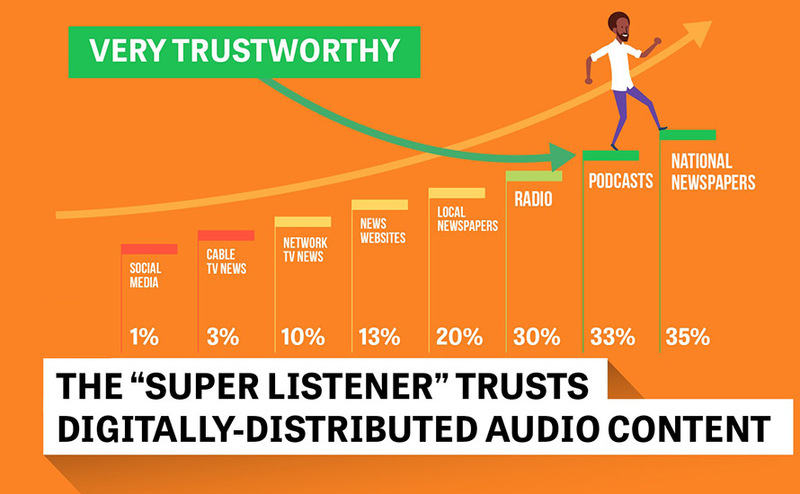 This, coupled with the news that Facebook will start to allow brands to deliver audio-only content and the continued rise in popularity of podcasts, requires us to think more broadly about how we create and distribute content across all channels, social and otherwise. 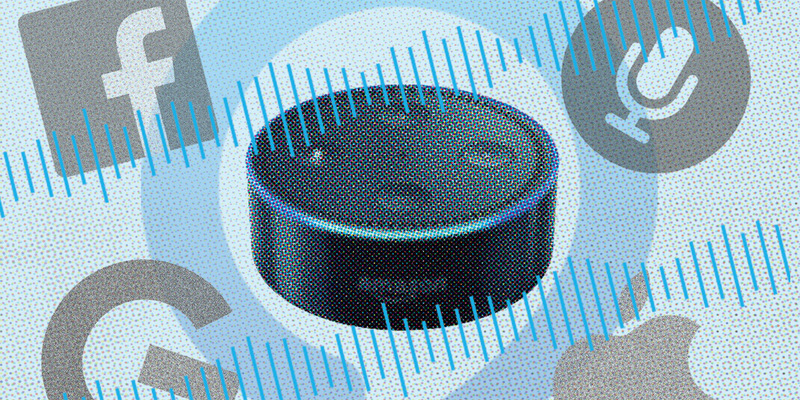 Social Listening/SENSE: As Amazon Echo’s continue to gain popualrity, this will be an incredibly valuable source of linguistic data that can help us better understand our audiences behavior and motivations with digital technology. Over the past 6 years, Houzz has developed a reputation as one of the premier brands for helping customers build their dream homes. Now, with the launch of it’s new app, Houzz gives it customers the tools to do just that in the digital space. 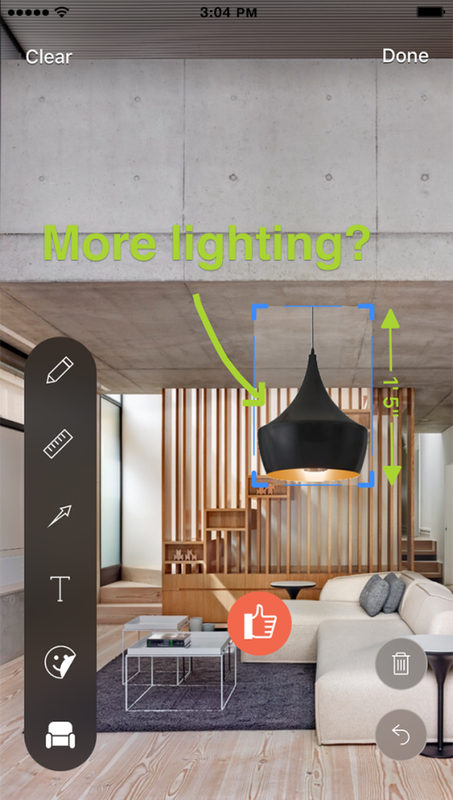 According to an article from The Next Web, the new app is complete with “sketch” and “collaboration” features that lets users take photos of their own space and annotate them in real-time using various tools features to construct their dream home/rooms. As we all know, today’s consumers don’t just interact with brands in one place. They want (and expect) to be able to connect with the brands that they support in both the physical and digital world. This app allow Houzz to build off of the already successful in-store experience that consumers know, love and expect; and translate that into an experience that consumers can begin from the comfort of their own home, or wherever inspiration hits them. 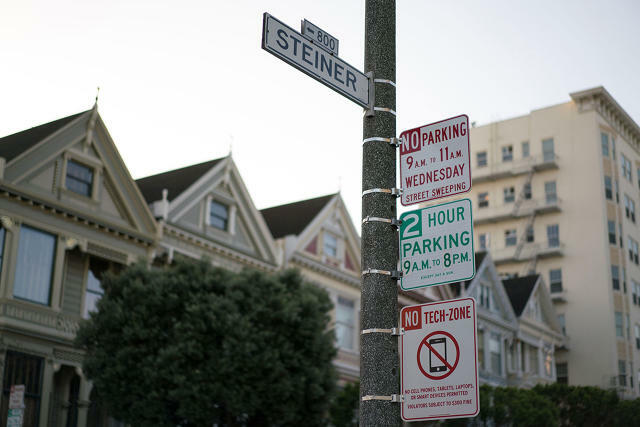 This project comes after San Francisco recently finished an initative to bring free wi-fi to parks around the city, with the tally currently at 30 parks and plazas. The first batch of signs were quickly removed from the park, but the artists continue to put up more. For more details, read the full article on Fast Company here. As digital marketers, we rely on our customers frequent and consistent use of various forms of technology. Without that, digital marketing would be a very different, and probably less successful endeavor. However, given the role we’ve seen advertising play in culture over the last hundred years or so, we should also think about what kind of culture we’re perpetuating and look for opportunities to improve it. The role of technology in our lives is a constant topic of discussion and the potential dangers that it poses are being shown vividly by these artists, which is a conversation that doesn’t seem to be slowing down anytime so. So, the question for marketers that comes out of this is, how can we use technology to enhance our consumers experiences in the physical world rather than pull them out of it? Knowing this information about what makes our brands’ audiences share will ultimately help us in developing social content and CTAs that get them to share content around our brand. A new movie called “Legend,” starring Tom Hardy, was recently released and has been making waves with critics. Unfortunately, not all of these have been good. 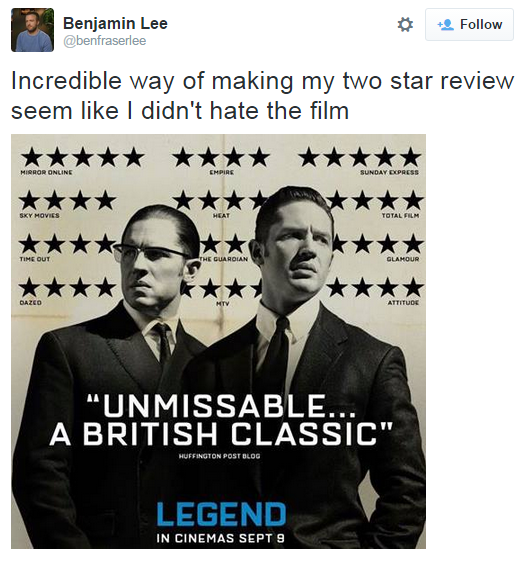 According to Adweek, The Guardian’s Benjamin Lee only gave the movie 2 stars. That did not let the movies marketing team stop them from promoting the movie and highlighting all reviews. In the tweet below from Lee, you’ll see how the poster was created to make the most of his 2 stars. Admittedly, this is not breaking news in the advertising or digital marketing world. However, this ad does propose an ethically questions that’s worth discussing. As the Adweek article states, the movie’s marketing team technically didn’t do anything wrong and took a very clever approach so showing all reviews, good and bad. However, anyone who looks at the poster can see that it is a bit misleading for that particular review. So, the questions stand, was this ethical on the part of the marketing team? What would the alternative be? Was anyone tricked here? Does it matter compared with all the other good reviews? Everyone loves viral videos. Consumers love viral videos because their funny, shocking, tear-jerking, depth-defying, etc. 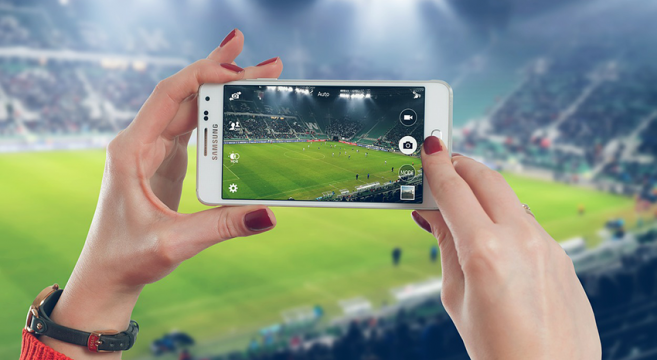 Brands love the idea of viral videos because of the seemingly free reach. And while that’s great in theory, the mass rush of all brands and marketers to create viral videos seems to to have made people forget some of the basics to creating impactful content, according to an article titled Here’s the Problem With All Those Viral Videos written by Jonah Berger, a Professor at Wharton and Author of the NYT Bestseller, Contagious: Why Things Catch On. In Jonah’s article, he argues that we need to move past the goal of creating viral content because it is very often unrealistic and doesn’t start with the brand’s target audience in mind. He then offers 4 “laws” to guide our thinking as we look to create content that drives results, which you can find summed up below. I’d urge you to read the full article above as well to get the full story. Social is great because it allows brands to communicate with large numbers of people very quickly. However, only 7% of word of mouth marketing happens online so we need to consider how our content translate to offline conversation and optimize for that. Getting a lot of views on your content is a very flashy metric to wave in front of people. But are the people viewing your content even interested in your product? In focusing purely on views, we lose sight of the real goal: turning consumers into advocates through content or services that means something to them. While views are an easy metric to track, they’re the wrong one to focus on. Instead focus on shares as this is a truer indication of resonance. Viewing is passive, sharing requires action. Don’t lose sight of your brand, and the value it provides, for the sake of creating viral content. If people can’t connect the content to the brand, or remember who made the video in the first place, the content ends up just being entertainment. As agency marketers, it is our job to truly understand the way effective communication works both on and offline and leverage that to meet our client’s business goals. The information provided in this article is rooted in the basics, however, with the internet producing a flashy new toy what seems like every other day we need to understand what can work and what may not be relevant to the brands we work on. Additionally, we need to be able to explain that to our brand partners. This article provides a refresher course on the basics that is rooting in the very popular trend of creating viral content, and should help us put things into perspective. Reddit has recently been cracking down on the types of content shared on the site. Mainly, from a harassment and indecency standpoint. While most people can sympathize with these efforts, there has been some backlash from the community who worries that this will start to have a negative effect on the freedom that this platform has previously offered. To learn more about Reddit, see these articles from Digiday and The Verge. So, where are die-hard redditors to go as their beloved platform goes through this transition? From the sounds of things, they will go to Voat. According to an article from We Are Social, Voat is a link-sharing platform that began as WhoaVerse back in 2014 and switched names 6 months ago. Voat is very similar to Reddit, but with one main difference: no subject is out of bounds, as long as it is legal. 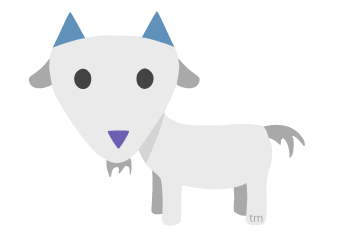 According to its own Twitter account, Voat saw its traffic explode, with 700,000 unique visitors just in the last 30 days. While Reddit has had minimal impact on social media marketing efforts in the past, it still remains a powerful tool for grass-roots social listening on virtually any topic. So, with Reddit in turmoil and potentially loosing participants, we’ll need to know where they go. Voat, then will be very interesting to watch. 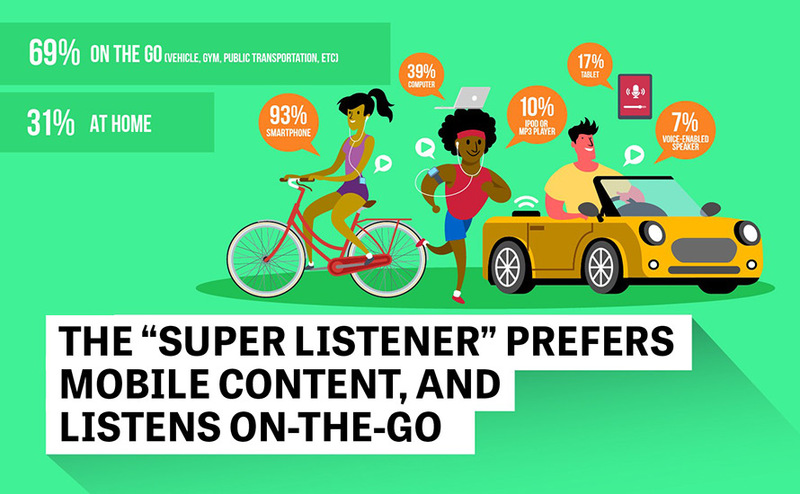 To find the answers to these questions, they leveraged YouTube TrueView and partnered with Mountain Dew, BBDO NY and OMD Worldwide to understand what mobile video advertising people are most likely to watch and how their views impact brand metrics. They used Mountain Dew’s Kickstart “Come Alive” spot- a popular ad on TV and TrueView that had been running for 2 months and earned nearly 9 million total views on YouTube – and made two new versions of it to see how it performed across different devices. You can find the original ad below. This ad features the classic story arc with a clear beginning, middle and end. Ideal for TV platforms and YouTube accounts where viewers are searching for video content. The second version below, titled “Big Punch.” As you can guess, this ad is optimized for current trends in mobile- putting the brand in the beginning before the viewers can skip the ad. The story line isn’t as clear in this ad but still has some action and works towards the goal of driving brand awareness. The third ad, below, is titled “Pure Fun” and completely flips the script on what we’d think a success ad (especially on mobile) is. It’s much longer than the others (1:33) is a bit confusing at first, has no perceptible story and the brand is featured much less explicitly than in the first two ads. When looking at the view-through rate metrics on desktop, there was no clear winner. However, when looking at the VTR’s on mobile, the third ad “Pure Fun” was viewed at a 26% higher rate than the other ads. How did this happen when the ad was three times longer than the others? Think With Google speculates that people were intrigued by the mystery of what they saw with the last ads so they were more interested in watching through the whole ad- compared to the others which may have been more predictable. That makes sense. The other piece of this puzzle is branding. The third spot was significantly lower than the others (54%) driving brand lift on mobile. However, brand awareness for all three cuts on mobile was equal. This shows that despite the second ad “Big Punch” having the logo right in the beginning of the ad, it did no better the other two spots in lifting brand awareness. For the full analysis, check out the article here. Fiat has designed and released a series of billboards in Germany that helps motorists parallel park their cars. Please find the article here and the video below. This is a very clever example of a brand taking a customer pain point that is associated with their category, and creating a resource that helps them to overcome it- with a little bit of style I might add. There has been a lot of talk recently about who is winning the social media video wars; Facebook or YouTube. While it’s true that Facebook has experienced strong growth in native video uploads over the past few months, its worth mentioning that YouTube is still the undisputed destination for video searching. The conversation here regarding videos on these two channels is constantly about which is reigning supreme, when really it’s more relevant to discuss how the two channels differ in usage regarding video viewing. Facebook is a great platform for accumulating engagement around video content as many users will passively view videos on Facebook. YouTube, on the other hand, is still the premier destination for actively seeking out video content and sharing it with friends, family etc. via email and other social networks. In Your Corner, an online resource where users can connect with licensed therapists and certified coaches through video chat and text sessions, just released a clever new ad spot that highlights the importance of seeking advice from experts and the dangers of not doing so. According to the interview on Adweek, the spot is meant to address the insight that people are hesitant to seek actual, professional therapy when in need, but still get it from other sources like friends, relatives, etc. It is also puts a modern twist on the bartender/patron relationship of advice-seeking and giving. This is great example of brands using audience insights to create relevant and impactful ads. Additionally, the added dramatization of this cultural happening is another example of marketers having fun with a brand whose product/service does not easily lend itself to that. Influencer marketing is an industry trend that has been growing in popularity over the last few years. Everyone knows it’s important and can be a great tool in helping your brand get the awareness it needs from trusted resources. But how important is it really and where are the stats to back it up? According to an article from We Are Social Media called Why Influencer Marketing Is The New King Of Content, 92% of consumers trust recommendations from other people over branded content. That’s huge, and all the more reason for us as marketers to explore relevant opportunities to incorporate influencer marketing into our social and digital strategies. This is hot because, as a major trend in digital marketing, it is worth exploring no matter which brand we were work in which discipline. As you can see in the “there are influencers in every industry” section of the infographic, this trend permeates pretty much every industry and has a positive effect. Additionally, as strategists, the more informed our strategies are with data the more impactful they will be both when presenting to clients and in rolling out to the masses. 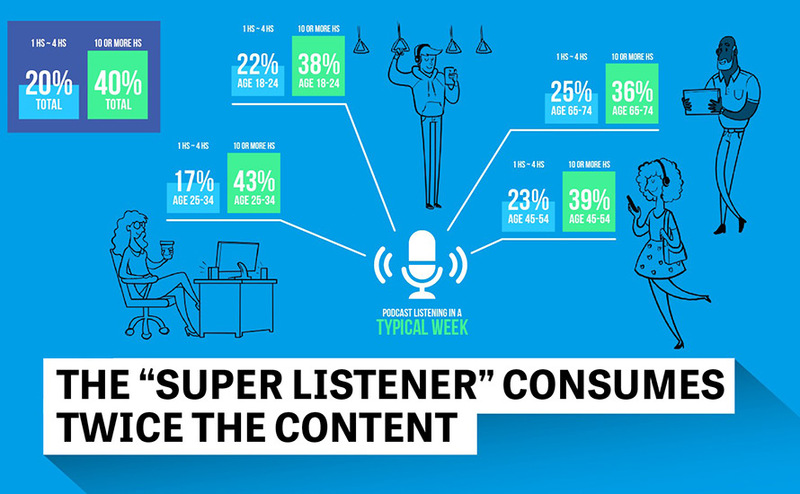 This infographic presents a ton of great data to help guide your influencer strategy. To promote a British fiction writing content for advertising writers, The Winston Fletcher Fiction Prize released a series of ads poking fun at the agency, client relationship. 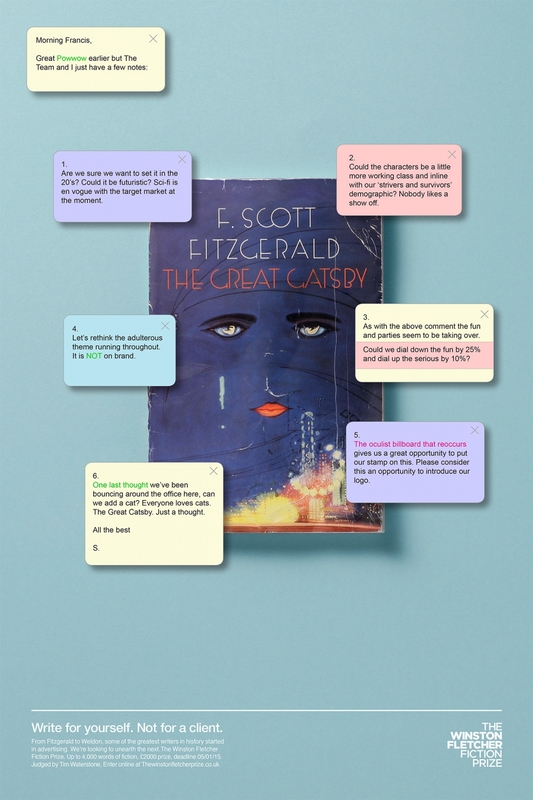 Within the ads, we see fake client feedback to F. Scott Fitzgerald’s The Great Gatsby, Joseph Heller’s Catch 22 and Salman Rushdie’s Midnight’s Children. The adweek article, which you can find here, also includes some interesting information about these authors’ past advertising careers. This is obviously a great example of knowing your audience and creating content that truly resonates when them. In addition to that, there’s an underlying message to advertisers that is worth noting. That message is to defend your vision. As strategists, we spend countless hours doing research to put ourselves in the mindset of the consumer in the effort of creating the best possible strategy for various campaigns and other initiatives. We have a vision for projects that sometimes, unfortunately, get’s challenged and changed due to both internal and external forces. Now I’m not saying that we should be ignoring feedback at all, however, this campaign is a nice reminder to defend our original ideas if we really believe in them because they may end up becoming masterpieces. Depaul and Publicis London recently launched an outdoor campaign to raise awareness for homelessness with a clever copy trick. As you can see in the article here, the campaign uses corners of buildings on to illustrate make the point that there are two sides to homeless, and it’s easy to only see one. This is a great example of brands thinking outside the box to create truly impactful work. These ads don’t shy away from some of the public opinion around homelessness. Instead, they tackle the public’s hesitancy straight on and then flip the perspective to show what it’s like for some people who struggle with homelessness. Finally, they bring it all together with a CTA to drive people to volunteer. 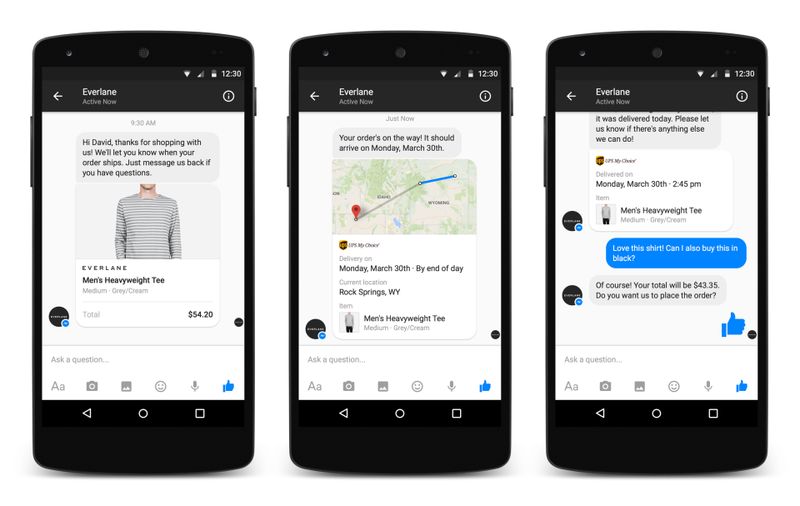 During the F8 conference, Facebook announced that its Messenger app would be getting a few new updates. One of these updates is that Facebook is opening up Messenger to brands. With the rise of social media, customers turn to the available platforms to communicate with brands. It’s no secret that social networks have become a key player for customer services teams to participate in everyday conversations with customers and prospect buyers. Messenger for Business seems to be the next evolution of that. This has major implications for how we engage on a 1:1 level with our audiences on Facebook. Moving a lot of these customer services centered conversation off the timeline, allows the focus to really be about the content we’re producing and the conversation we’re trying to stimulate that really drives value. This allows us to focus on that in public places and direct these more personalized interactions into a more private setting where we can provide customers with quality, customer assistance. 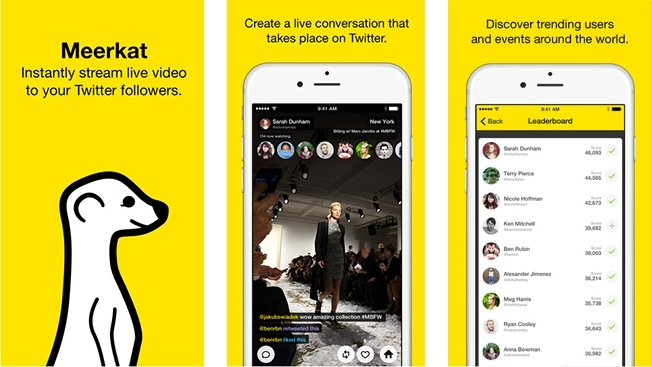 Meerkat is a new video streaming app that has been taking off at SXSW this week. Similar to Periscope (recently acquired by Twitter), this app allows people to live stream video content to their followers. If the buzz around SXSW is any indication, live streaming apps like these are the next step for video sharing on social media. 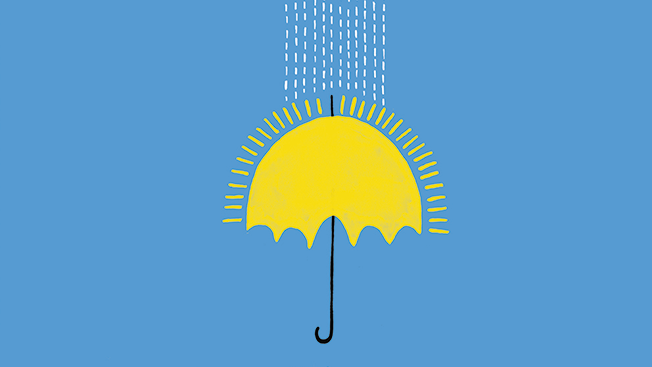 For more information on Meerkat at SXSW, visit Adweek and WeRSM. The rapid rise in popularity of Meerkat is turning a lot of heads, especially at SXSW. The 3 week old app had 120,000 users going into SXSW and has experienced growth at 30% per day. Additionally, this app seems to be thriving in spite of all the work that social giant Twitter is doing to slow it down. Last week, we heard that Twitter acquired live streaming competitor Periscope to integration into it’s platform. Additionaly, Twitter pulled the graph capabilities from Meerkat to further thwart it’s progress. Despite all of this, Meerkat is thriving and I for one am exciting to see the growth of this app in the coming months. Accordingly to an article from We Are Social Media, Twitter has acquired a streaming video app called Periscope. The article states that Twitter will be working with Periscope to closely integrate their functionality and allow Twitter users to broadcast videos live in their Twitter feed. Twitter already has video-sharing capabilities, but streaming is a whole other story. This would allow Twitter to further establish itself as the king of real-time information sharing on social media. This has huge implications for sports, fashion and other event-based marketing. It may also push marketers to create more physical brand activation’s that they could use the streaming service for. One thing is for certain, this places even more emphasis on the importance of video content on social for 2015 and beyond. This is a fantastic example of a brand speaking to their audience in a language that they already know. This religiously grounded and fictitiously enhanced spot takes a scenario that marketers know all too well and inserts their brand services directly at the center of it. It’s funny, has great shock value and made to be shared. Job well done.